I have to admit that I bought this book back in 2009 when it was first published and I have always ‘meant’ to read it (although this hasn’t stopped me from recommending it and lending it to colleagues). Well, the time has come. 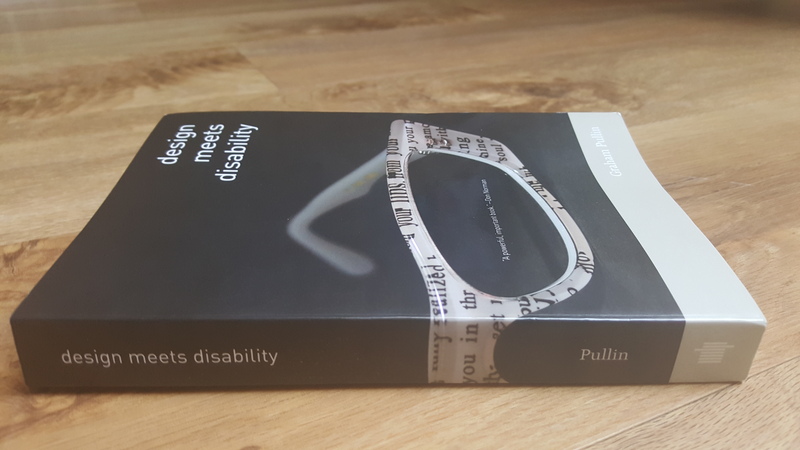 In Design meets Disability, Graham Pullin demonstrates how design and disability are not two separate entities, but they can inspire each other. The author argues that the priority for design for disability has traditionally been linked to ‘enable’, while attracting as little attention as possible. Priority has been given to ‘concealment’ when it comes to the aesthetic design for disability, alongside ‘minituriasation’ and ‘discretion’. Surely if you paint a set of hearing aids in pink that resembles the colour of flesh,then nobody will be able to know that you are wearing them, right? Considering a different context, the author also argues that the design of prosthetics has equally traditionally followed two approaches: ‘realism’ and ‘functionalism’. But would more confident and accomplished design support more positive images for disability? Mr. Pullin devotes part of his book to speculating about what might happen if, say, Jonathan Ive, head of design at Apple, applied the design sensibility that produced the iPod Shuffle to hearing aids, or the furniture designer Jasper Morrison worked on wheelchairs. So, why shouldn’t design sensibilities also be applied to hearing aids, prosthetic limbs, and communication aids? In return, disability can provoke radical new directions in mainstream design. Charles and Ray Eames’s iconic furniture was inspired by a molded plywood leg splint that they designed for injured and disabled servicemen. In a similar fashion, the boon encourages designers to be inspired by disability. How many examples of design for disability can you think of that not only they serve a medical purpose but they are also aesthetically pleasing and become fashionable? The book is very well written and offers lots of examples and images to support its argument and stimulate creativity.The author makes the argument that a richer balance between problem solving and playful exploration can open up new and valuable design directions. Each chapter in the book is then dedicate to discuss a distinct tension that exist between the two cultures found within design and medical engineering. There is a chapter on ‘fashion meets discretion’, and a chapter on ‘identity meets disability’ that challenges the distinctions between inclusive design for special needs. The last chapter The second part of the book presents a series of interviews with designers about specific disability design projects. I have to admit that I have enjoyed the first part of the book more- as I found some of the stories very inspiring and the design ideas innovative. Highly recommended and thought provoking this book should be on everyones shelf.